One of the more subtle species on our London display was this fragrant orchid. 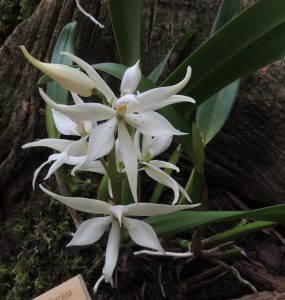 This Prosthechea species native to Venezuela (as the name would suggest) as well as Colombia and Ecuador. It is reported to grow in wet lowland forests and so we are growing it in Warm Americas (Min 16C) at bench level where it will stay damper than plant hung high in the roof.